We were involved in short-term and long-term contracts and outsourcing services, providing support during all stages of the software development projects. Define sales stractegy. Work with clients. Write about exhibitions, technical articles, user manuals, etc. Scrum master, Product owner, Project Manager. We hire not only for skills, but for attitude. You can learn the missing skills - we will help you. GARANTIS offers an exciting business environment that gives people the ideal conditions to express themselves better, and to grow both personally and professionally. We recognise the value and contribution of all of our colleagues from the most junior through to the most senior. You will meet a variety of customers and explore prospects across different companies and sectors. You will work in an international environment, which continuously offers opportunities for personal growth. Being a software development and consultancy company located in Reading, the UK - the center of British Silicon Valley - our specialists work across Europe, including Germany. You will be confident to share your ideas and expectations with commercial and technical contacts, inspire our customers with your capability and enthusiasm. You will enjoy the interpersonal side of productive working relationships: the pleasure of meeting together, discussing different aspects of our future, and our passions. You can start in one area, and move to other areas to build your experience across several areas. One of our specialists says: "I started purely from a consultancy and development background and now I have experience in presales, project management, team leadership and public speaking. I also keep my eyes open to technological innovation. Without the company's trust and support, this would not have been possible." We work to provide you with a great learning environment and will help you to grow your career by investing in you. We strongly encourage employees to take on new opportunities, and this includes opportunities to learn from each other. You will learn a huge amount through your experiences working on our projects. 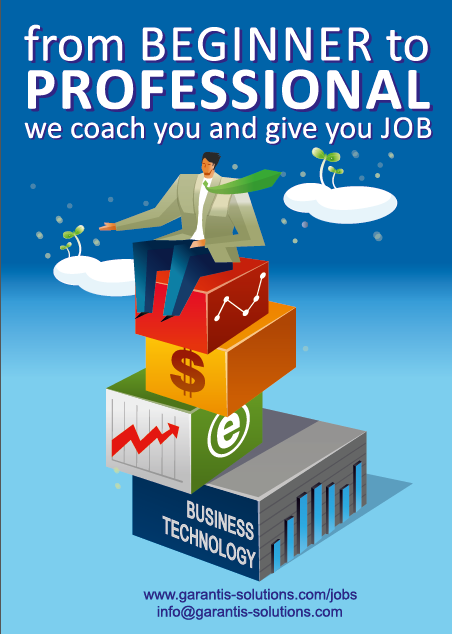 We also offer training and development programs to get you started in our business quickly and efficiently. 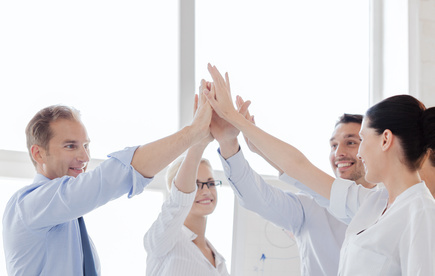 Our company believes that employees’ individual growth is strongly linked to the company's growth. Our training covers technical skills, communication skills, presentation skills, management and leadership. Our colleagues are encouraged to coach each other. In particular, more experienced colleagues mentor the younger members of the team. By sharing knowledge and experience, we often discover that we have an existing solution to a problem or that we can find a novel answer. Our technical managers bring technological innovation to our customers, grow the team and invest time in sharing their experience with you. We lead by proactive example. Working with GARANTIS IT Solutions is about harnessing your passion - and giving you more. We recognise that work occupies an important place in life and the passion for our work is essential. The fact is that work takes 50% of your daily time. So why not spend this amount of time with passion, invest into self-development, achieve new horizons! Being able to work with passion is a privilege that GARANTIS IT Solutions gives to each member of its team. Together we reach new heights of success by investing in your self-development and growing your passion. We would like to hear from you - please get in touch with us!